A blog recently requested by the editor of Sage Publications’ Methodspace highlights an article representing focus group data in a new way. In a recent report, two BU Academics, Lee-Ann Fenge and Kip Jones (FHSS), took an inventive approach in writing up their findings in the online journal, Creative Approaches to Research. The Sage editor said, “I thought your paper brought up some good methodology issues”. The authors believe that as narrative researchers and storytellers we should be promoting narrative in the content and styles of our publications. We can no longer afford to ignore the great advances that have been made in representation of qualitative data in recent history. As narrative researchers, we are natural storytellers and need to keep this in focus when reporting studies, particularly in publications. In this way, as researchers, we move to the background, and the research participants are foregrounded. The article “I’m her partner, let me in!” in Methodspace can be read here. A centre to provide leadership and management development opportunities and support across the health and social care sector has been launched at BU. The Centre for Leadership, Impact and Management in Bournemouth (CLiMB) offers a range of development options – including leadership and management programmes; coaching and mentoring development; accreditation for in-house programmes; and consultancy, research and impact evaluation. The centre has been launched after more than five years of research and development in the field of leadership and management in health and social care. Professor Brown was asked by the government’s Social Work Reform Board, established following the death of Peter Connelly, to develop a leadership pathway for social work managers. This was extensively evaluated for impact and then adapted for healthcare in response to the Francis report at Mid Staffordshire Hospital. CLiMB currently receives HEIF funding. Higher Education Innovation Funding aims to support and develop a broad range of knowledge-based interactions between universities and colleges and the wider world, which result in economic and social benefit to the UK. Professor Keith Brown, Director of the Centre for Post Qualifying Social Work at BU, has been added to the list of speakers at the Mental Capacity Act Deprivation of Liberty Safeguards (MCA/DOLS) conference. The national conference, which is the first of its kind, will focus on the current industry after MCA and DOLS legislation has been put in place. Exhibitions from agencies and organisations will be displayed at the conference to further contribute to the knowledge of attendees. The day will be filled with presentations and various discussion groups around relevant topical issues. Discussions will focus on whether the legislation has made a difference, the issues people are still experiencing and what still needs to be done to raise awareness and get people thinking about MCA/ DOLS. The conference will be held on Tuesday 28 February 2012 at Inmarsat Conference Centre, London. 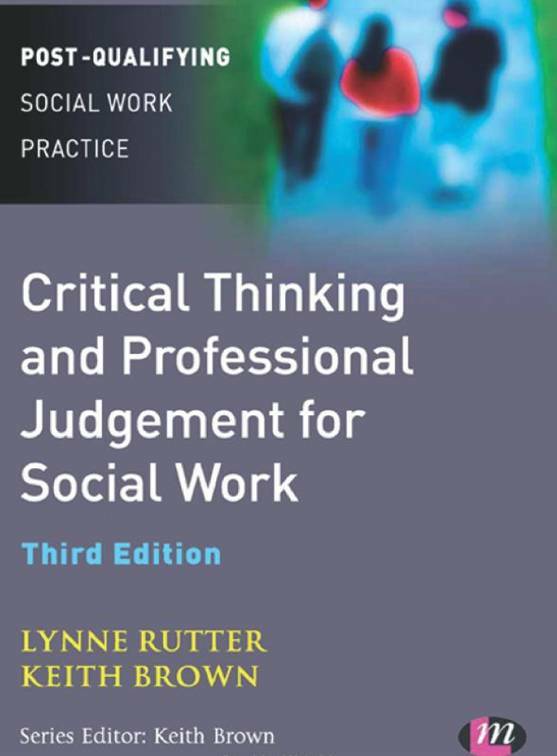 Professional judgement, communication and critical reflection are vital aspects of a social worker’s role and a new book, ‘Critical thinking and professional judgement for social work’, aims to empower post-qualifying students to develop these skills. Author Lynne Rutter from the Centre for Post Qualifying Social Work at Bournemouth University explains more about professional learning, a new way of thinking and her own research. “I am intrigued by the psychology associated with learning. It is obviously an emotional and very personal experience, especially for qualified practitioners, but it should also be an empowering experience. “For me, professional higher education is about developing more complex thinking which has practical, reflective, personal, moral, as well as objective, conceptual and theoretical aspects. All these aspects are part of professional reasoning and judgement and ultimately professional understanding and knowledge, and so are equally important. 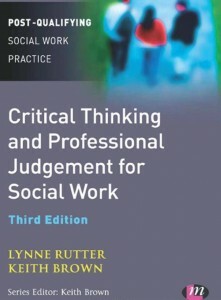 Order a copy of ‘Critical thinking and professional judgement for social work’. A new report that will serve as a blueprint for effective leadership in social work and social care has just been published by the Centre for Post-Qualifying Social Work at BournemouthUniversity. 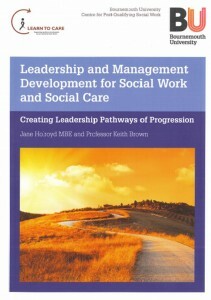 Entitled ‘Leadership and Management Development for Social Work and Social Care: Creating Leadership Pathways of Progression’, the ground-breaking report is co-authored by Professor Keith Brown, Director of the Centre, and Jane Holroyd MBE on behalf of Learn to Care, the body which represents workforce development managers from all local authorities in England. The report provides the UK’s first framework for establishing an effective Leadership and Management pathway in social work and social care. It addresses the major concerns and recommendations identified following the Peter Connelly case by the Social Work Reform Board (2009) and the Munro Review of Child Protection Services (2011) in terms of the call for a clear leadership and management strategy for front line social work managers. This new framework has been developed over the past 18 months and has involved rigorous testing and piloting. 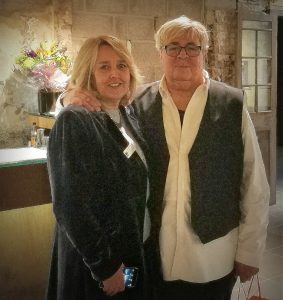 A new underpinning theory and approach, Self-Leadership, which critically emphasises the quality of thinking and developing the abilities to manage self as part of improving personal and organisational performance, has been developed by Professor Brown and Jane Holroyd. Holroyd suggests this model is applicable to all professions, whatever their managerial position, as all professionals will be leaders within their own sphere of influence. The report also highlights the critical role of assessment and evaluation to demonstrate that individuals have reached the required levels of competence and that a return on the investment is evidenced. Conor Burns, MP for Bournemouth West, has hailed the framework as enormously important for the future of long term care in the UK. “Reputationally for Bournemouth University, this is an incredibly important breakthrough. What we are currently doing with social work and social care training is teaching without testing and training without measuring the impact,” he said. “As a state, we are spending millions and millions and not questioning the effectiveness of that spend”. The Centre for Post Qualifying Social Work at Bournemouth University is at the leading edge of post qualifying social work education in the UK. It works with over one third of all local authorities in England and over 70 major employers, including training social workers within the armed forces. The Centre’s portfolio of courses are designed to raise standards in social work practice and help those in social work and social care demonstrate their competence to work within complex situations with the most vulnerable in our society. Of particular note, this leadership framework has been developed to meet the requirements of the NHS Leadership Qualities Framework and it is anticipated that this will be of real value, especially as we see increasing integration between the NHS and Local Authority community services in the coming months. Congratulations to BU’s Professor Keith Brown from the Centre for Post-Qualifying Social Work. Keith co-authored a report with Learn to Care that contains details of a leadership development scheme for social workers currently underway in Hampshire. The scheme aims to give managers the confidence to lead through change and hold staff to account, and is already being viewed as a model for other local authorities. Details of the scheme are contained in a new report that outlines a strategy of guiding principles on leadership development and a proposed “pathway of leadership progression”. Aimed at giving managers the confidence to lead through change and hold staff to account, it is being seen as a model for other local authorities.